You are here: Home / Healthy Living / Is Monsanto’s Poison in Your Breakfast Food? Is Monsanto’s Poison in Your Breakfast Food? Last year, the International Agency for Research on Cancer determined Glyphosate – the active ingredient in Monsanto’s Roundup, as a “probable carcinogen”. Use of the herbicide has been steadily increasing since it’s introduction into the consumer market in 1974. 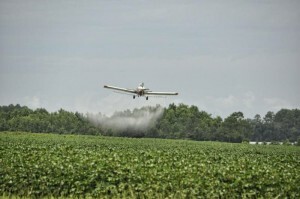 It is now the most widely used agricultural chemical in history. This year, for the first time ever, the FDA will begin testing for glyphosate residue in some foods. Glyphosate has become ubiquitous in our environment. It has been detected in blood, breast milk, and urine samples. According to laboratory testing commissioned by the organizations Moms Across America and Sustainable Pulse, U.S. women had maximum glyphosate levels that were more than eight times higher than levels found in urine of Europeans. A recent study by The Alliance for Natural Health (ANH) tested common breakfast foods for the presence of glyphosate. Ten out of 24 foods tested in ANH’s analysis had detectable levels of glyphosate. This included oatmeal, bagels, coffee creamer, organic bread and even organic, cage-free, antibiotic-free eggs. We cannot stress the importance of knowing the source of your food enough. Farmers Markets, Community Supported Agriculture (CSA) programs, Door-to-Door Organics, and home gardening are ideal options to reduce herbicide residue in your diet. Eat organic whenever possible and thoroughly wash all produce before consumption. Article adapted from Organic Consumers.